More and more people on Earth, see the mysterious phenomena in the sky, as well as unidentified flying objects. Governments of all countries withhold information from its citizens and put pressure on witnesses and the media. This resource was created to promote the free flow of information on UFOs and paranormal phenomena, bypassing the ban and censorship of the government. People need to know the truth! UFO on orbit of the Sun - hiding the truth. Monitoring of the Sun - Online. World hoax scientists and NASA - Sun critical condition! Mars - Secrets and Hiding NASA. Secrets of the lunar mission of NASA "GRAIL"
UFO Research near the Sun and Moon! NASA Hiding! APP FREE! 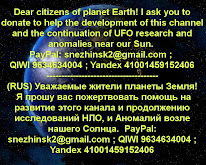 Monitoring of UFO activity in 24 hours. Breaking news! Full deciphering of the alien signal WOW - 6EQUJ5 !!! 2016. Crop Circles - decrypting messages. Sensational investigation! Mystery, flown away from the plane Amelia Earhart. 2016. The destruction of an unidentified object in space by a giant laser beam. NASA scientists have confirmed that the planet Nibiru collide with the Earth in July 2012. Melted Mountain & Ancient Pyramids Found In Siberia? Ghost filmed during a tennis match! Click on the picture to help. Donate to fight for the truth! Subscribe To UFO - the awareness of humanity. ©myunhauzen74. Awesome Inc. theme. Powered by Blogger.